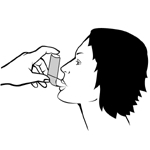 Shake the inhaler several times and uncap it. 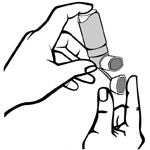 Before using this inhaler for the first time, or if you have not used it for more than a week, prime it following the manufacturer's instructions. 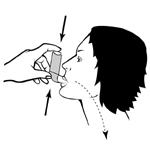 Holding the inhaler upright (canister up), place the mouthpiece in your mouth. Tilt your head back slightly. 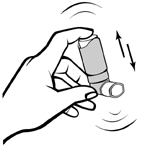 As you take in a slow deep breath, squeeze the inhaler. Continue breathing in as long as you comfortably can. Hold your breath 10 seconds or even longer if you can. If you have to take a second dose of the same medication, wait at least 30 seconds between puffs. Recap your inhaler after each use. Clean the device once a week, according to the manufacturer's direction. If you have any difficulty using your inhaler, talk to your pharmacist, who may suggest you use a spacer, which is a special device designed to make metered-dose inhalers easier to use.